The Chinese Revolution was a transformative event in world history. Today, the People’s Republic of China is one of the most powerful nations on Earth. With its huge population, a diverse economy worth more than $US8 trillion per annum and the most imposing military force in Asia, China is set to become the world’s preeminent superpower. China, however, was a comparative latecomer to the modern world. At the turn of the 20th century, the Chinese nation was fragmented and still mired in the past. Its government was dominated by feudal monarchs who claimed to rule on behalf of heaven. Its economy was largely agricultural, carried by labouring peasants, while its social structures, practices and traditions were more medieval than modern. Pre-revolutionary China was also disorganised and disunited, making it easy prey for imperialist nations like Britain, France, Germany, Russia and Japan. These foreign powers established spheres of influence within China, exerting control and exploiting its people and resources. The seeds of the Chinese Revolution can be found in the anti-imperialism and rising nationalism of the 19th century. 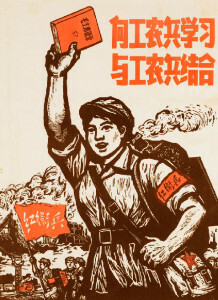 The Chinese Revolution was a revolution against many things: foreign imperialism in China, the Qing monarchy, privilege and inequality, exploitation and corruption, national disunity, China’s military and economic weakness. Because of this, change was driven by different groups and leaders, each with different ideas and aims. The revolution was one of several distinct phases: the late Qing period (to 1911), the early republic (1911-16), the Warlord Era (1916-27), the Nationalist period or ‘Nanjing Decade’ (1927-37), the war with Japan (1937-45) and the Chinese Civil War (1945-49). During these periods different groups and leaders vied for control of China. A final victor emerged in October 1949, when Mao Zedong and the Chinese Communist Party proclaimed the People’s Republic of China. Mao and the communists had their own plans for rebuilding and modernising China – but their visions for a modern China would come at an enormous human cost. Alpha History’s Chinese Revolution website contains hundreds of primary and secondary sources to help you understand the evolution of China between 1898 and 1976. Our topic pages, written by experienced teachers and historians, provide concise summaries of key events and issues. They are supported by reference material like timelines, glossaries, maps, quotations and profiles of prominent historians. There is also a range of online activities, such as crosswords and multiple choice quizzes, where you can test and revise your understanding of China in revolution.